So that everyone can have that special birth gift, our Good Times Baby Hampers and Baskets can be purchased for less than 75€. 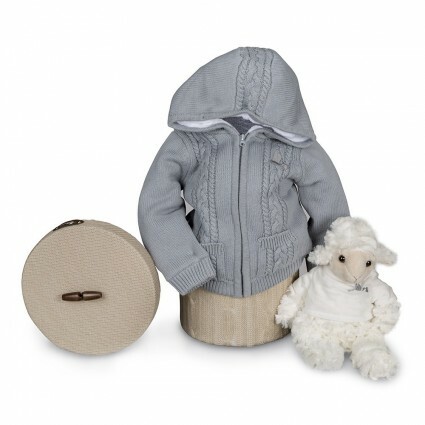 A unique gift that includes baby clothes and accessories that are ideal for the baby's everyday routine, such as bodysuits, knitted jackets, dungarees or rompers. All come with a cuddly soft toy and are presented in a beautiful vintage, knitted or wooden box, according to which one you choose. Delivery in 24-48 hours in Spain and 48-72 hours in the rest of Europe. The Happy collection is the perfect present for the birth of a new baby. Mum and Dad will love this original little gift. All BebeDeParis gifts include a greeting card with the baby’s name and a congratulations card. If you want to choose a unique baby gift that will make people smile, the Happy collection is the perfect present.